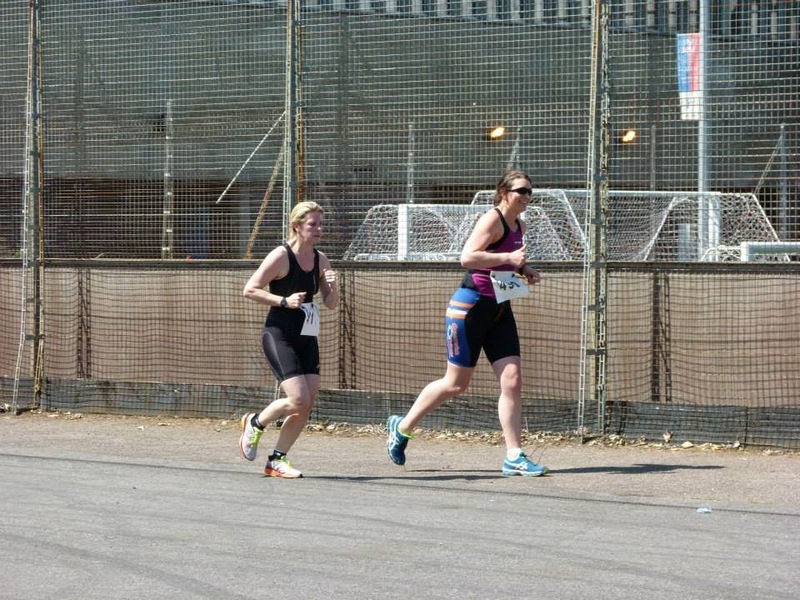 The Crystal Palace Triathlon is one of the most popular triathlons and sells out within hours of entries opening. I guess this is because it's a pool swim, closed road for cycling, really good for supporters and a good start for beginners. 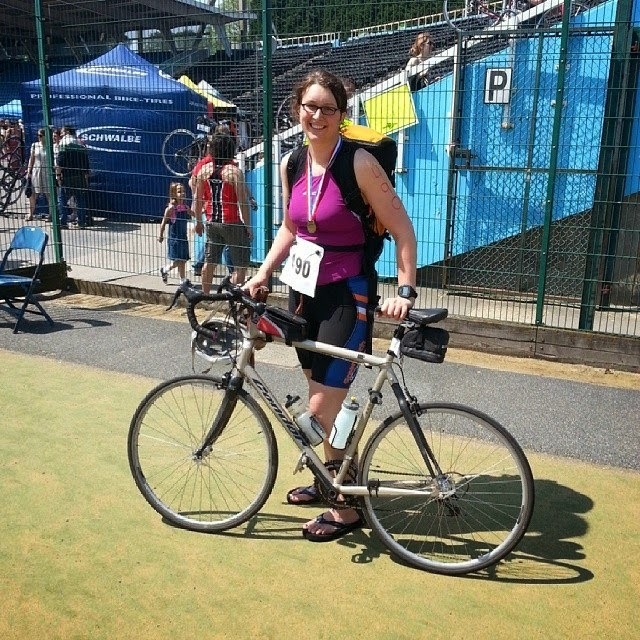 I entered because a lot of my friends had and I'd never done a pool swim triathlon before. Here's my report. I arrived just after 8 on the morning so I was there in good time (didn't need to be in the pool before 10!) and unpacked my bike (which I'd had to take the wheel off to fit in the car) and took it and my things towards the start. This seemed to involve an awful lot of carrying the bike down the stairs (remember the stairs for later). On our way in we'd been warned that there was a Mini rally. What I didn't know was that the rally was also starting in the grounds of Crystal Palace itself, so we ended up wheeling our bikes past some amazingly classic Minis - beautiful cars! I registered, took my bike off to transition and then found a good spot next to a fork in the bike rack - I like to put all my stuff between my bike and a fork. The transition area appeared to be full of sand - I guess the volleyball courts next door had travelled some of their sand over. In racking up and sorting all my stuff out I managed to get sand all over my hat and goggles. I was looking out for my fellow Tritons, and finally figured out the guy a rack away from me was John from the group. Once I was ready, I went into the pool area. I was amazed at the breadth of Crystal Palace and the facilities on offer - pretty much any sport you might be into is catered for here. A lovely 50 m pool, with people already swimming in (they started just after 9). I went up to collect my chip and was told to hang fire, so I watched the current swimmers to see where they were swimming and then decided to go back out to transition to see whether any of my friends had arrived. By this stage they had and were setting up their bikes. Thea bless her was looking distinctly nervous, this being her first triathlon, so we were trying to encourage her. My nerves were jangling too! We walked back inside and cheered Thea on as she started. Soon it was my time to start. I hung around the start, received my timing chip and got into the diving pool for a quick practice swim. That helped to ease the nerves, it was good to be in the water again. 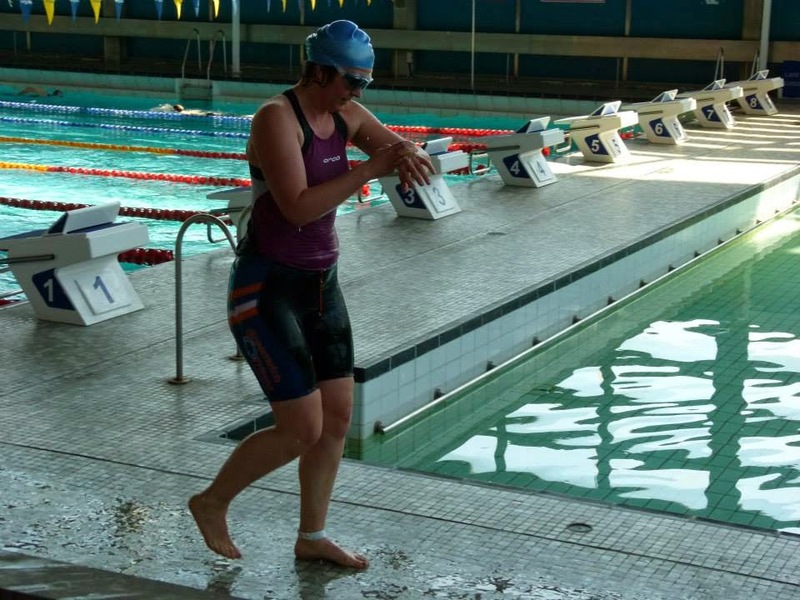 I don't know how people who don't really like the swimming bit can do triathlons - I love to swim and being in the water makes me feel relaxed (most of the time!). Alex went off a few people ahead of me and then it was my turn. I quickly got myself into a rhythm and started swimming. The swim went OK. I spent a bit of it feeling a bit sick and hoping people wouldn't overtake me. I had to overtake someone and then I could see people coming up behind me. One woman overtook me and then slowed down as she had to take on the full force of the water without streamlining behind me. This was frustrating as I was pretty much on her toes all the way after that, to the point where I wanted to overtake her but I just wasn't fast enough to get past her and it was too much effort. At least it distracted me from my nausea! At the end we got out, and after being strictly told no running, walked out of the building to transition. Transitioning without a wetsuit on is a lot easier and a lot faster so I was two minutes faster than normal getting out of transition. Off out on the cycle course I went. The cycle course comes out of the stadium and almost immediately straight up a rather nasty hill. We would have to climb up this hill nine times to get round the course. The hill's not long, just very steep, and I could see everyone struggling up it and we all bunched up as we heaved ourselves up it every time. There were loads of people round the course, a few of them friends who were cheering me on every time I went around, which was great impetus to keep going. Of course going uphill means going downhill and to be honest I don't know which one I dislike the most, and I'm sure I shouldn't have been braking down the hill but I didn't feel very safe coming down it!! As I went round the course I decided that the socks I'd put on in transition were uncomfortable and baggy. I also noticed that a few of the other cyclists had very sandy bottoms - I guess a few of them had put on cycling shorts for the bike leg or perhaps had sat down to put their shoes on. I lost track of the number of trips I'd taken around the course so had to use my Garmin to try and figure out how far I'd gone. When it got up to 19 km I reckoned I must be on my last lap, thank goodness. Looking at my times now it seems I was pretty much consistently about 5 minutes 30 per lap, so at least I'm consistent. as it was getting hot and I knew the socks made my feet get too warm. The run is always going to be the hardest part and it being hot didn't help. I was determined to run the whole way and not walk, as I saw a few people doing, so I started back up the hill (again! that blasted hill!) only to be greeted at the top by people brandishing water. Oh, that water was good, but trying to drink while running is always a bit of a struggle for me. I made it round, to be cheered on by the Tritons telling me I was looking relaxed (is this a good thing?) despite the fact I had a terrible stitch and was suffering and then I had to go up the hill again. There was also a rather evil car park that we had to run up and down again which felt a bit daft! I'd guessed that I'd managed to get some sand into my shoes as they were rubbing quite hard on the way around, but the second time round was easier than the first (I almost felt like I could go round again!) and finally I came into the stadium (where some racing greats have run) to do my final run. I was tired, but having everyone cheer me on gave me the impetus to try and get a bit more speed up round the final bend and come in... at 1:45. I was dehydrated, sore and almost boiling from the heat. Then I decided to take my shoe off to inspect the damage to be greeted by a large popped blister... that almost brought me to my knees. Being hot and injured almost always makes me pass out so it was a good thing that Carol was there to feed me water until I felt better. Finished at the end... relieved it's all over! 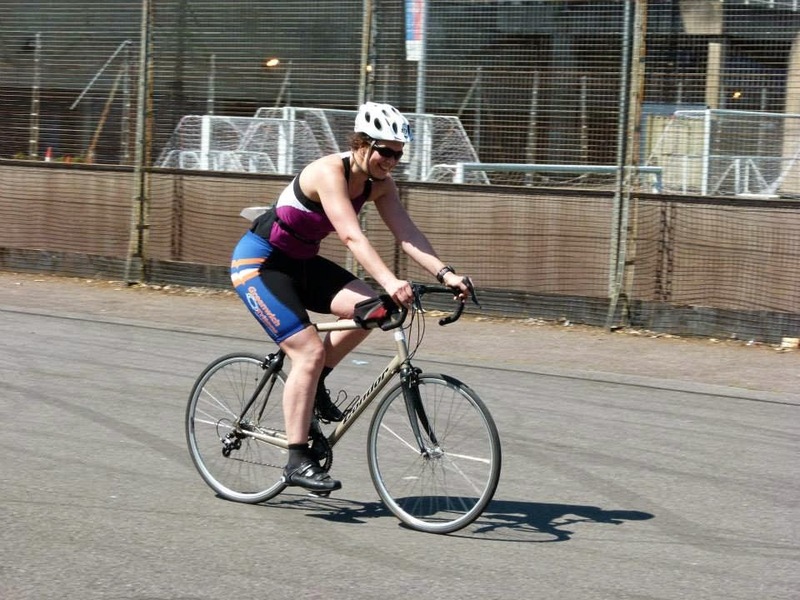 Everyone was standing around in the hot sun, but I felt like I'd had enough exposure for the day, so I went off to sort out my transition area. I was very grateful that I'd brought my flip flops so I didn't have to put my shoes back on over my horrible blister. Taking the bike back to the car almost felt like a workout itself - we had to carry them back up the stairs we'd carried them down earlier, but this time in the blistering midday sun. We waved goodbye and discussed maybe meeting up later on in the day. By the time I'd got home, had something to eat and a shower I realised I was not going anywhere and was completely exhausted! What a day, although I don't think I'd do it again - I think I prefer open water events. P.S. Thanks to Nadja and Thea for the great photos! Are we having any fun?